INSTRUMENT LIFE OF TWO ROTARY NiTi SINGLE-FILE TECHNIQUES WITH RECIPROCATING AND CONTINUOUS ROTATION USED IN CURVED CANALS AFTER A GLIDE PATH CREATION. Purpose: Manufacturers have introduced instruments made with new alloys and with reciprocating motion trying to improve the fracture resistance of rotary NiTi files. The aim of this study was to compare instrument life of WaveOne and One Shape single-file techniques used for the instrumentation of artificial curved canals after a glide path creation. Material/methods: Canal preparation was performed on 100 Endo-Training Block simulators divided in two equal groups, depending on the file used. Average lifespan and cumulative survival at the time of WaveOne files (Dentsply Maillefer) with reciprocating rotation and One Shape files (Micro Mega) with continuous rotation, after a glide path creation, were tested. All shaping instruments worked till fracture occurred. During mechanical instrumentation each file was coated with Glyde™ (Dentsply Maillefer) to act as a lubricant, and copious irrigation with 5.25% NaOCl was carried out. Results: Twelve shaping files were used in canals’ preparation, after their initial enlargement, and ten of them broke: 2 WaveOne files and 8 One Shape files. The average lifespan of one WaveOne file was 17.50±2.12 canals and of one One Shape file–4.63±1.30 canals. The difference was statistically significant (p<0.001). The WaveOne instruments presented a significantly longer survival than the One Shape files (р<0.05). Conclusions: Within the limits of this study, the WaveOne files showed significantly higher resistance to fracture compared with the One Shape files. Instrumentation with files with reciprocal motion increases significantly instruments life and makes them safer during shaping of root canals. Karova E, Topalova-Pirinska S. Instrument life of two rotary NiTi single-file techniques with reciprocating and continuous rotation used in curved canals after a glide path creation. J of IMAB. 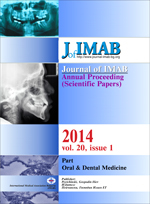 2014 Jan-Jun;20(1):494-499. doi: 10.5272/jimab.2014201.494. 24. Webber J, Machtou P, Pertot W, Kuttler S, Ruddle C, West J. The wave one single-file reciprocating system. Roots. 2011; 1:28-33.